Turnabout is fair play. In one of my earlier posts entitled “Dragonflies mating on a calf” I featured Walter Sanford, a fellow photographer and blogger. Today, in a posting called “The natives are friendly.” he featured my arm and finger as I tried to charm a couple of different dragonflies to perch on my index finger. Most dragonflies are skittish. Some dragonflies are “friendly,” such as Blue Corporal dragonflies (Ladona deplanata). Autumn Meadowhawk dragonflies (Sympetrum vicinum) are friendly; sometimes very friendly! 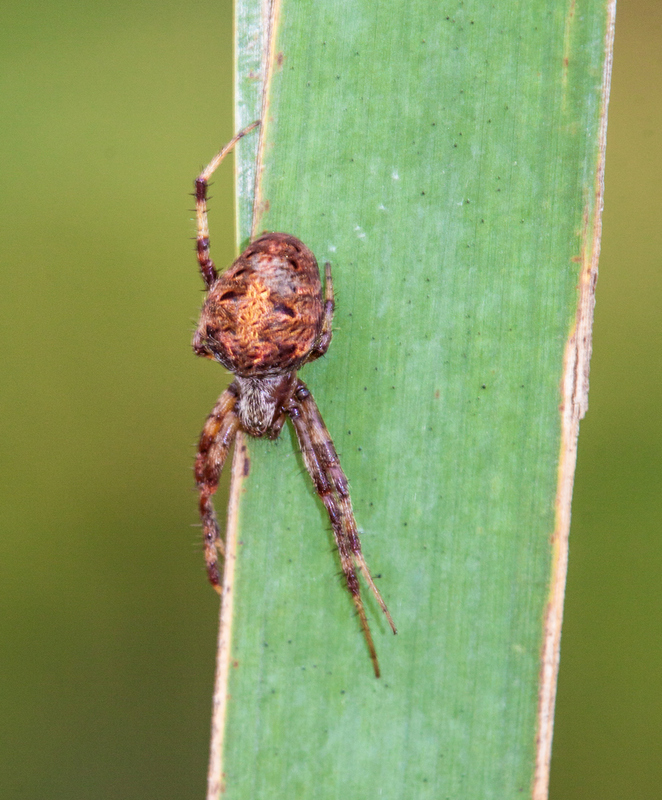 Mike Powell and I visited Huntley Meadows Park recently. We stopped to “charm” dragonflies a couple of times during our photowalk. The following gallery shows two different male Autumn Meadowhawk dragonflies perching on Mike: Photos 1-2 show Mike coaxing a dragonfly onto his finger; Photos 3-4 show another dragonfly perching on Mike’s arm. Tech Tip: Either mouse-over or tap photos to see captions. 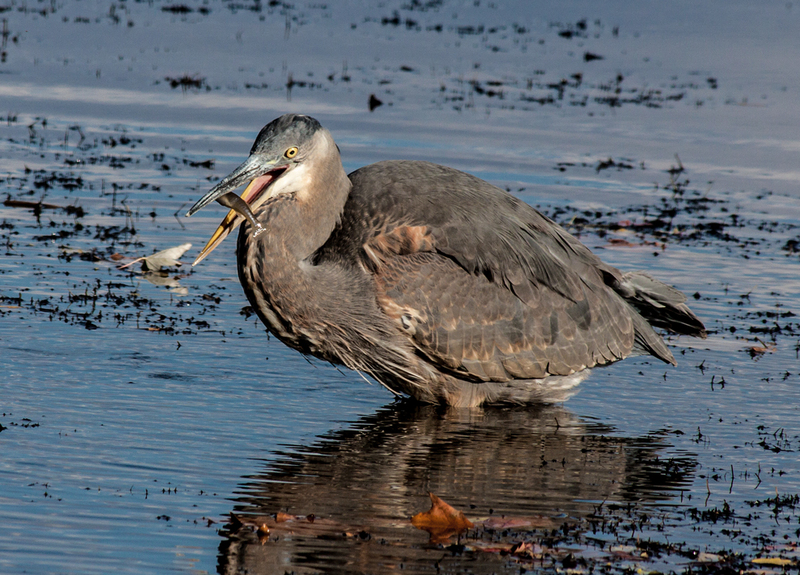 If you are a heron, how do you get a fish down your throat and into your stomach after you have caught it? Some animals and birds of prey might tear off a bite-size piece of the fish using claws or talons. Herons don’t have that option. They have to somehow maneuver their catch within their bills until they are in a position to swallow it whole, all the time at risk of dropping their catch back into the water and losing it. I enjoy watching Great Blue Herons (Ardea herodias) fish. They seem to be extremely focused, but patient as they wait for the optimal moment for a strike. This past weekend, I observed this heron in the waters of the Potomac River, just south of the city of Alexandria, Virginia. I watched and waited with my camera focused and ready until the heron struck and pulled a modest fish out of the water. The heron made several adjustments to the fish’s position by making small movements with his head until it was in the ready position shown in the second photo. He them gave a little flip of his head, launching the fish into the air, and opened his mouth wider, as you can see in the first image. 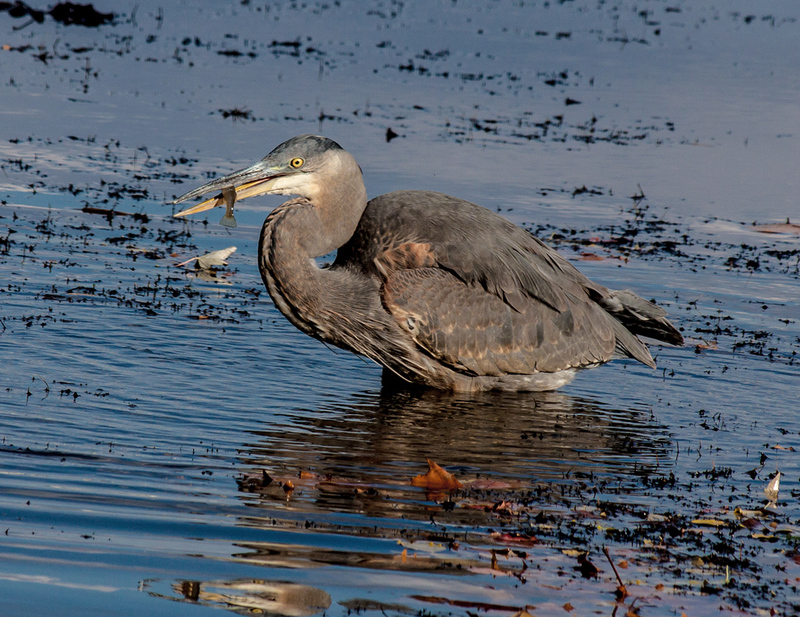 In a split-second the fish was gone and the heron was swallowing. The first time I saw a bird that looked like this, I thought it was a sparrow of some sort. 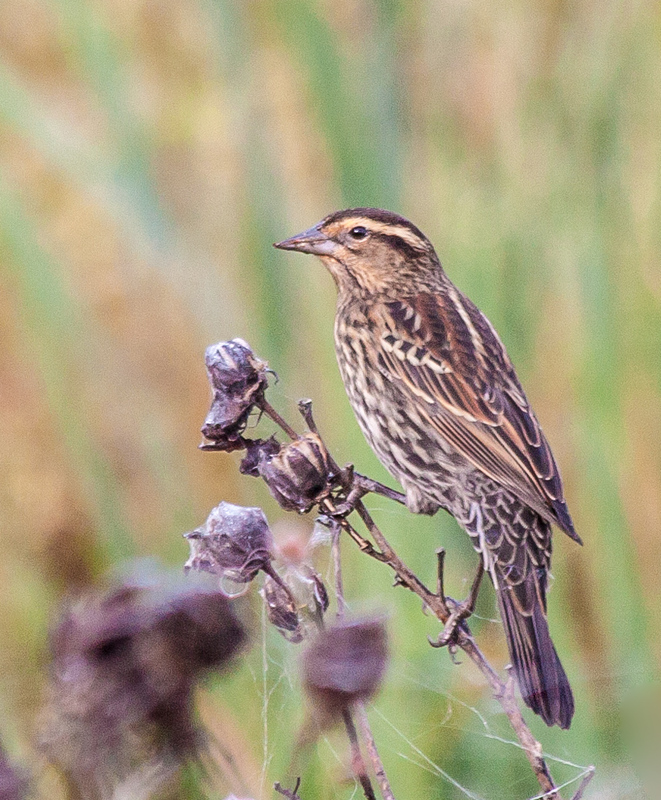 When I saw this one, last week, I knew immediately that it was a female Red-winged Blackbird (Agelaius phoeniceus). I have learned a lot about birds and photography this past year. 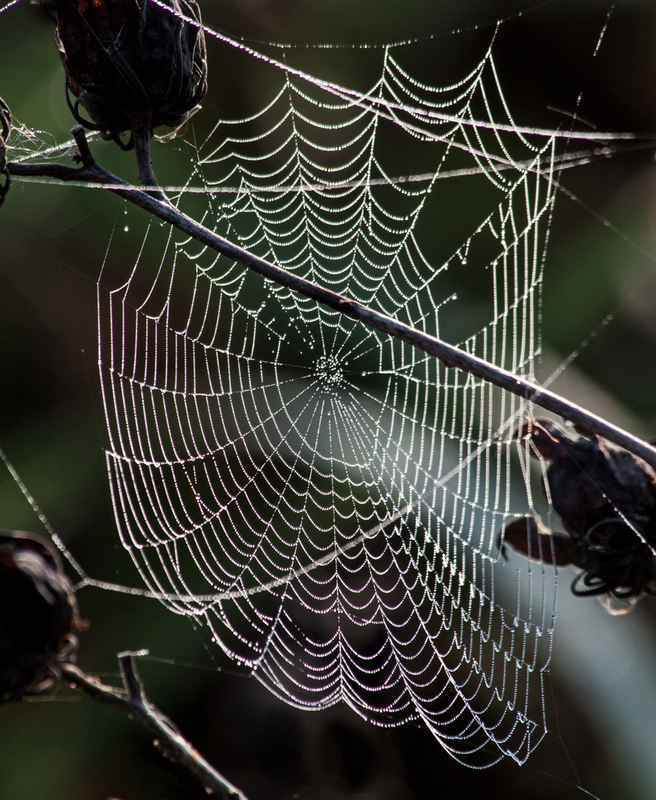 Along the way I also have learned more about myself as I seek to express myself in my words and in my images. I haven’t seen many migrating ducks yet at my local marsh, so I traveled to the Potomac River this weekend, because I had heard from a birder that there were numerous ducks there. There were lots of Mallards, some Northern Shovelers (I think), and this cool-looking duck with a distinctive white patch on its cheek that I could not identify initially. 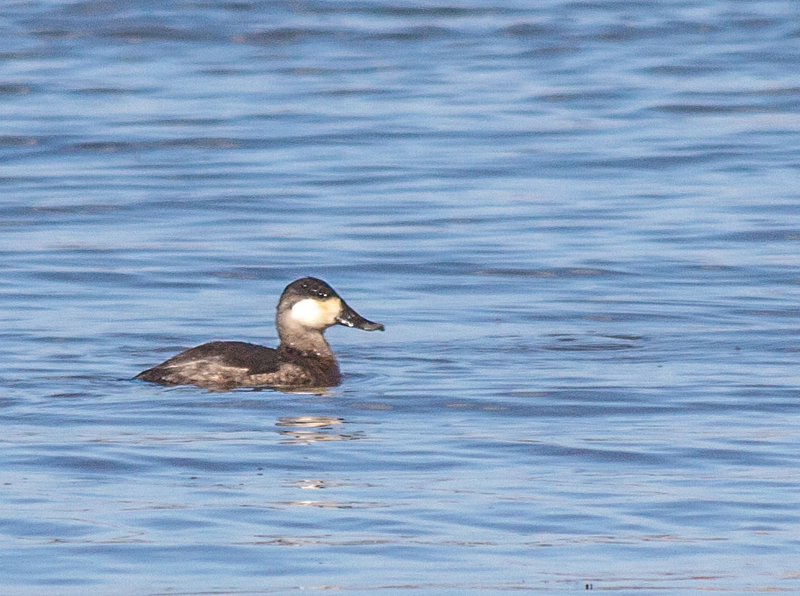 After I returned home, it didn’t take long to figure out that this as a Ruddy Duck (Oxyura jamaicensis), a species that I had never seen before. My eyes caught a flash of bright blue yesterday as I was walking through Huntley Meadows Park, my local marsh, and I pointed my telephoto lens at the tree in the distance. As I composed this shot, I was initially a little confused by what I saw. The reddish-brown color of the breast and the fact that there were some blue feathers made me think that it was an Eastern Bluebird (Sialia sialis), but the bird’s body didn’t seem blue enough. 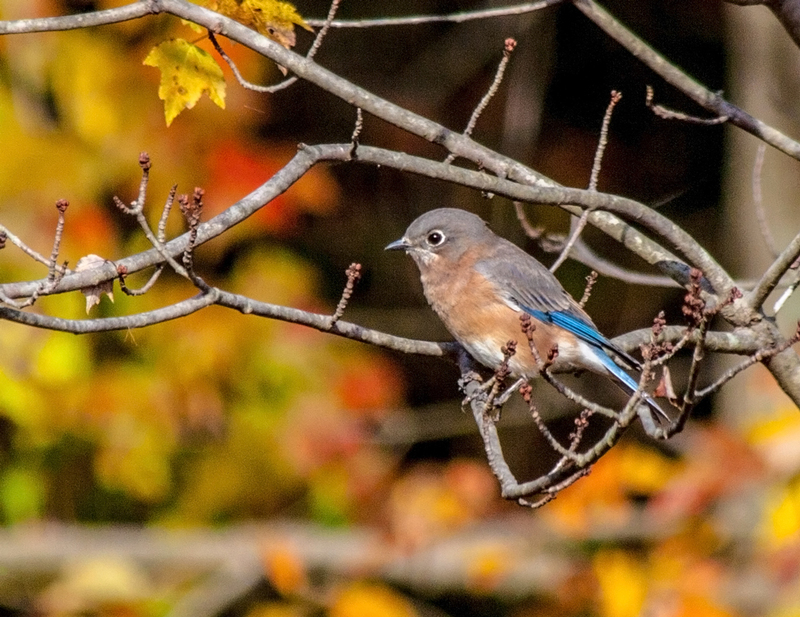 After doing a little research when I got home, I realized that most of the bluebirds that I had seen previously must have been adult males—as is the case with many other birds, the female Eastern Bluebird is more subdued in color than the male. I didn’t have a lot of time to frame this shot, so I was happy that I managed to center the bird on the dark spot in the background and to surround it with some colorful fall foliage. All of the orange color in the image really helps the blue on the wing to pop, which is not too surprising since, if I remember color theory correctly, orange and blue are complementary colors.